This card uses this week's Color Challenge #177 on SCS of Groovy Guava, Whisper White, and Sahara Sand, along with the Grid Technique for a faux tile look. I have been wanting to try this technique for so long, and I think Baroque Motifs is the perfect stamp set for it. The results remind me of tiled kitchen backsplash. HERE is a wonderful Grid Technique Tutorial by Beate Johns. 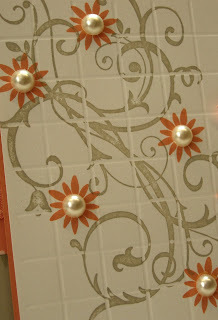 * I scored the Whisper White CS every 1/2" before stamping the Baroque Motifs images so the faux grout lines stay white. 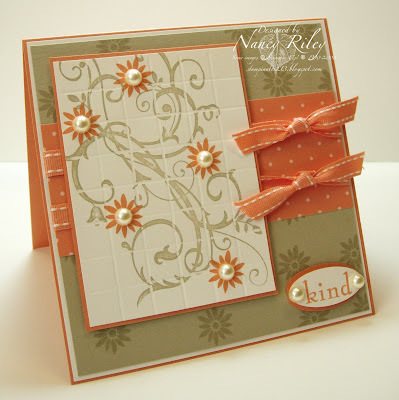 * The flower image on the Sahara Sand background piece was stamped in Versamark. * There are two Groovy Guava small ovals staggered behind the Whisper White oval with the sentiment stamped in Groovy Guava. Simply GORGEOUS Nancy! I love it! Isn't that grid technique easy but fun?! OMG! this is awesome! the colors are perfect! i bet this was fun to make. Another Nancy Riley beautiful creation!!! This is gorgeous! What a great CC this week. Nancy, this card is absolutely GORGEOUS!! Very impressive! Wow! Nancy, this is gorgeous! I love the layout! Awesome card! TFS! This is gorgeous Nancy. I love the scored grid pattern with that stamped image. Beautiful pearl accents. Nancy this is a beauitful card. Love the grid pattern! Wow! What a beautiful card. I love that image with the grid. It looks so pretty. The pearls are the perfect touch. This is beautiful! I have used this technique making diaganol score marks and the baroque stamp set. This is my favorite stamp set! WOW Nancy, Stunning card! LOVE your beautiful design and colors. I love your card! It reminds me of beautiful tile work on the back of a kitchen wall. It's beautiful! This is beautiful! The baroque swirl is perfect for that technique...it really looks like tile. Love all the pearls! You are amazing! Love this one too! You are SO TALENTED! OMGosh, L O V E this!!! Gorgeous! Great technique! Love the little details on the flowers.